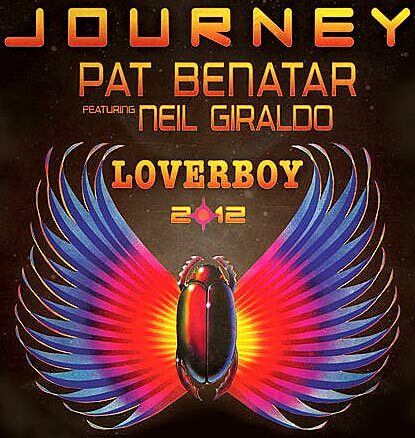 Loverboy is a veteran Canuck 80s rock band and will support Journey on their 2012 tour, along with fellow classic rocker Benatar & her husband Neil Giraldo..
At their height of their respective fame in 1982, Journey and “Working For the Weekend” rockers Loverboy embarked on a tour together. Now, 30 years later, the two acts are hitting the road again, joined by Pat Benatar. The current incarnation of Journey — featuring vocalist Arnel Pineda in place of original frontman Steve Perry — will celebrate the release of a new documentary about Pineda, Don’t Stop Believin’: Everyman’s Journey, next month when the film closes the San Francisco International Film Festival. Benatar (who is joined by her longtime guitarist and husband Neil Giraldo) has remained a constant touring presence, hitting the road on her own and with the likes of Blondie, REO Speedwagon and The Bangles. Loverboy, meanwhile, received inadvertent attention in 2011 through a memorable placement on TV’s 30 Rock, when a character (Pete Hornberger) reveals a secret past as Loverboy’s original bassist (hint: he was not).